It has been a year since my last visit to Northern State Hospital Farm. Today kids were running around spraying plastic pellets from toy guns at one another. Another woman seemed to be photographing families - mostly those whose kids seemed indignant about the situation. Here's a hole in the wall. I loved these dark images, possibly too dark for some. This has been one of my favorite places to visit over the past three years. I have folders of images that haven't been processed and are awaiting discovery. I like this. In the same way that I still have books to read by some of my favorite authors, who have ceased to exist at this point and won't be writing anymore. Savor the flavor of the experience, for me I can dip back into this emotionality that this place evokes quite easily when playing with these images. 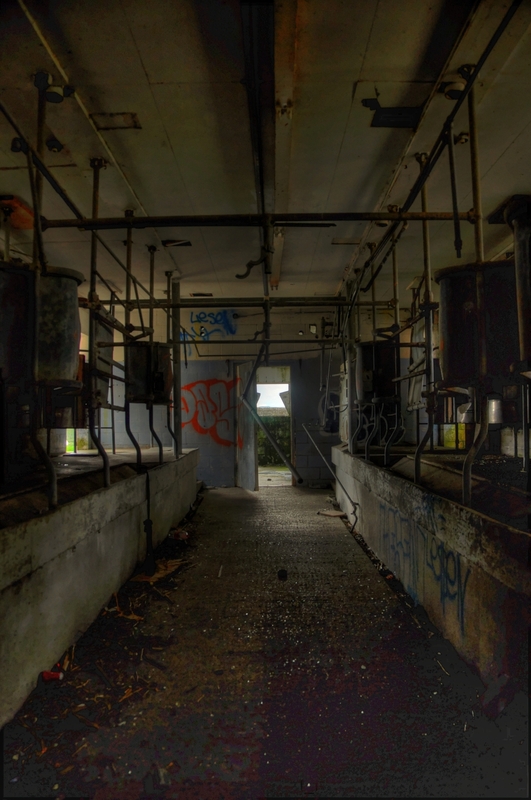 Looking from inside where the dairy cows once got milked. Milking stations to the left milking stations to the right.